Donald Trump may have turned getting fired into a national catchphrase though his "Apprentice" TV show franchise, but for the average worker, there's little that's entertaining about being told, "You're fired." Just ask Anthony Bostic. Five years ago,he was dismissed from his job as director of relocation for the Atlanta Housing Authority, which oversees the city's low-income housing programs. Bostic (pictured at left) contends that the action was in retaliation for his efforts at exposing wrongdoing at the agency. As many do who find themselves unexpectedly unemployed, the Atlanta native began by busily sending out resumes and applying for jobs. Quiet weeks passed, and to fill those hours he turned to crafting cufflinks, a hobby he'd picked up about a year earlier. Little did he know that his newfound hobby would lead to a career as an entrepreneur that nearly six years later provides him a modest but steadily growingincome of about $40,000 a year. "I'm still excited to see where it leads," Bostic said in a recent interview. 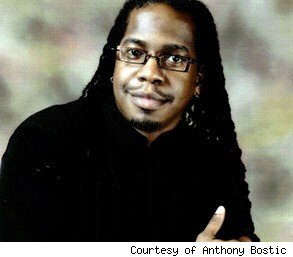 Bostic, 39, became interested in cufflinks in 2006 while working logistics at the Soul Beach Music Festival in Aruba, a side job unrelated to his work at the Atlanta housing agency. While there, he checked out some of the many jewelry merchants in the area and found four particularly striking pairs of cufflinks. "I have never been big on fashion -- then or even now -- but I always liked cufflinks," Bostic explained. In pursuit of others, he made the rounds of more than 30 merchants in Oranjestad, the Aruban capital, but was disappointed to find little variety. It was then, Bostic says, "I just decided that in order to get what I wanted, I would simply have to make them." To that end, he searched the Internet and found a supplier that sold backings for cufflinks, and a trip a few months later to a jewelry supplier in Charleston, S.C., yielded some "funky stones and beads and knickknacks." That was the start. By Thanksgiving, Bostic had created 12 pairs of cufflinks for himself and began wearing them regularly and "proudly," he says. Soon, admirers took notice and began making requests. So he crafted 50 more pairs, selling them for $20 a set. By the end of 2006, he says, he had "a hobby that paid for itself." Bostic's hobby would soon become his livelihood when he was fired a few months later from his job at the Atlanta Housing Authority, after he allegedly discovered underpayments by the agency. The reduced payments, made to thousands of relocated families in public housing, may have led to many of them becoming homeless, according to a 2007 report by the Atlanta Progressive News. Bostic declined comment to another news source on the left, Political Affairs, at the time, citing possible pending legal action against his former employer. In a recent interview, Bostic told AOL Jobs that he sought to fight his discharge under federal whistle-blowing laws, since AHA received funds from the U.S. Department of Housing and Urban Development. But since the alleged actions taken by AHA resulted in the federal government saving rather than losing money, federal whistle-blower laws didn't apply, Bostic says attorney research revealed. Unable to undertake an expensive legal fight, Bostic said that he reluctantly dropped the matter. Contacted by AOL Jobs, Atlanta Housing Authority spokesman Rick White declined comment about Bostic's dismissal, citing state privacy laws, which prohibit discussing personnel matters. White did say, however, that the agency has never had a case involving an employee who acted as a whistle-blower, nor has any employee been terminated for accusations made about shorting payments to residents of the city's public-housing program. Shortly after he was fired, Bostic began selling his cufflinks at local festivals. He found a loyal following from customers who appreciated Bostic's larger and more colorful designs that don't get lost on men who are particularly tall or heavy. As sales grew, he realized that his business, which he named Uniquely Cuffed, had potential, so he expanded into other types of jewelry and online. "I was determined to only do cufflinks," he says. "But so many women expressed interest in my work that I finally gave in and started doing rings and bracelets and eventually earrings, necklaces, bottle stoppers and other novelties." Bostic, a single father of an adopted son, says his venture brings in roughly half that of his former job -- about $40,000 a year. Still, he says, that income combined with an amount earned from part-time social work, as well as modifications to his personal finances, means that he is in better financial shape than he was prior to his dismissal. The prospects for his jewelry business are so good, Bostic says, that he has turned down offers of full-time work, because he wanted to see how far his jewelry business could go and, "I was having a ball." Nearly five years after leaving the Atlanta Housing Authority, Bostic says he's more disappointed than angry about losing his job, adding that he is "at peace" with not pursuing legal challenges to his dismissal. For his own mental health, he says, "I just had to let go and move on."